The battery life in the Harmony remote will vary depending on usage. As your Harmony replaces all of the remotes in your home entertainment center, it is doing the work of multiple remotes which can drain batteries at a faster rate than a single device remote. Harmony will retain all of your device and Activity information when replacing your batteries. 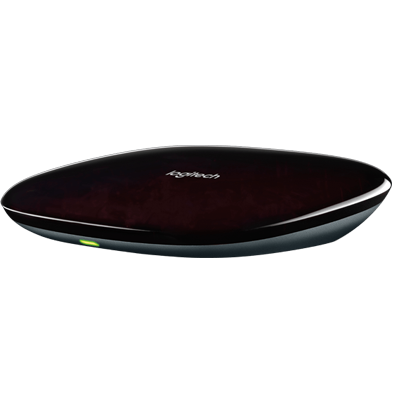 The Harmony Pro, Elite and 950 remotes use one rechargeable lithium ion battery. 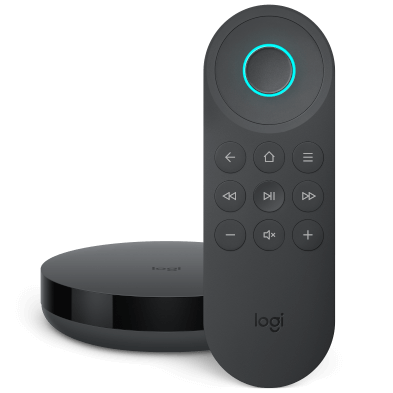 If you're looking for a replacement, one can be purchased in the Logitech Spare Parts store (in the Batteries section). Open the USB port cover and use a #0 Phillips screwdriver to remove the two screws. Remove the end cap and two screws on the underside of the remote, you should now be able to lift the baseplate. Lift the battery and disconnect the cable to remove the battery from the remote. Connect the battery's power cable and insert the battery. Re-attach the bottom case and replace the screws. Replace the end cap, screws, and USB port cover. The battery in Harmony Touch, Ultimate and Ultimate Home remotes is rechargeable and not replaceable. You should only attempt to remove the battery from the remote at the end of the product's life for proper recycling. Open the USB flap on the bottom of the remote, remove the label and remove the screw. Separate the top of the case from the bottom. This may take some force. Unplug the wire connector, then remove the four screws that secure the battery holder. Unplug the battery connector and remove the battery. Dispose of the battery and product according to your local laws. Harmony recommends keeping your remote in the charging cradle when not in use. This will ensure the batteries stay full and will help avoid misplacing the remote. Harmony Smart Control and Companion (formerly Home Control) remotes use one, three volt coin cell lithium battery, type CR2032. Under normal remote usage, the battery is expected to last one year. Using two thumbs, slide the battery compartment open. Push down on the battery to spring it loose. Replace the battery and slide the battery cover back on. Harmony 200/300/350/600/650/700 remotes use two AA batteries. Pull up the battery tab which will make removal of the batteries easier. Insert two new AA batteries, remembering to keep the tab positioned underneath for future removal. You should always replace the batteries in pairs, and both batteries should be of the same type. Avoid dropping the Harmony remote onto hard surfaces or in a vertical position as this may cause the remote to reboot. If the remote reboots when pressing a button, try replacing the batteries. Harmony Smart Keyboard uses two AA batteries. Under normal remote usage, the battery is expected to last one year. Replace the batteries and slide the battery cover back on. Don't mix old and new batteries. 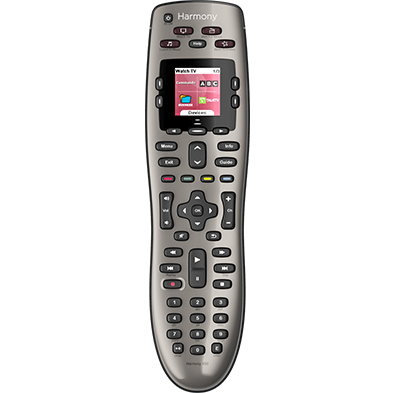 The Harmony One remotes use one rechargeable lithium ion battery. Using one thumb, press down the battery cover release button. While the button is pressed, slide the battery compartment open with your other thumb. 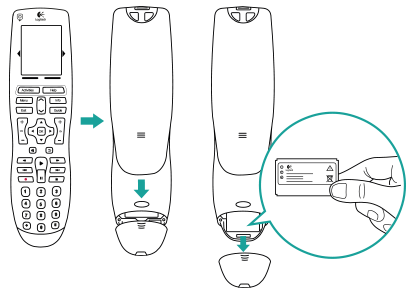 The battery life in your Harmony remote will vary depending on usage. Since Harmony replaces all of your home entertainment center remotes, doing the work of multiple remotes, the batteries may drain at a faster rate than a remote which only controls a single device. Removing your battery will damage your remote. The battery in your Harmony Express is rechargable and not replaceable. You should only remove your battery to properly dispose of it. 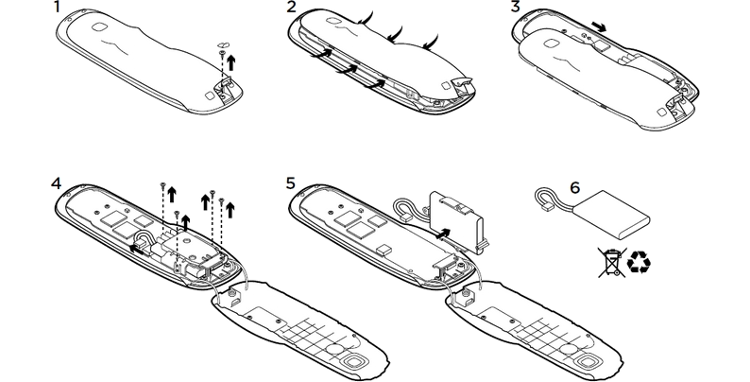 Place a large flat-head screwdriver inside the USB port and twist to separate the bottom cover. Using a philips #0 screwdriver, remove the four screws from the plastic housing of the battery. Do not try to separate the battery from the plastic housing. Disconnect the battery cable and remove battery from the remote. Replace the battery and snap the battery cover back on.